Garden tidying is now high on the agenda and we can help you with a wonderful new range of compact cordless tools. There are 4 machines in this group. The FSA. 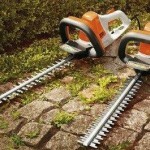 56 hedge trimmer which weighs only 3.7kg, has a run time of 40 minutes and its 45cm blade will cut branches up to 16mm. The FSA trimmer is very powerful and only weighs 3.3kg with an auto cut head taking 1.6mm nylon. It will run for up to 20 minutes on a full charge as will the BGA 56 blower. This powerful light weight, 3.3kg, blower has an airflow of 600m3/h and air flow speed of 45m/s. These three machines all come complete with their own battery and charger and are only £199.00 each. The final machine in this range is the MSA120 C-BQ chainsaw with a 12” bar and weighs 3.7kg which has a runtime of 35 minutes. The battery recharge times are only 50 – 105 minutes for an 80% charge. Visit our shop to see the full range of Stihl cordless products including the very popular HSA25 hand held garden shrub shear and grass trimmer. After the summer, lawns will be looking a bit tired. Rejuvenate by using a good quality Scarifier such as the John Deere D31RE electric one, which we have on special offer right now, or the Petrol Viking LB540. Once you have scarified the lawn, the easy way to remove the debris is to use your blower and blow the material to one side for easy disposal. The final step is to feed the lawn using an autumn fertiliser; spread evenly over the lawn, this will help the grass roots to develop and be ready for winter. Autumn pruning should now be in full swing and the best way to dispose of the material is to use a Viking shredder. There are 7 models, each of which do different jobs, so it is important to select the one which is most suited to your requirements – we are happy to advise the machine most suited to your needs. Remember that shredded material can be put to excellent use by recycling in your garden compost, saving you the need to fill the car and head of to the recycling centre. If you use wood as your winter fuel, it’s time to saw and split your logs ready for storage. 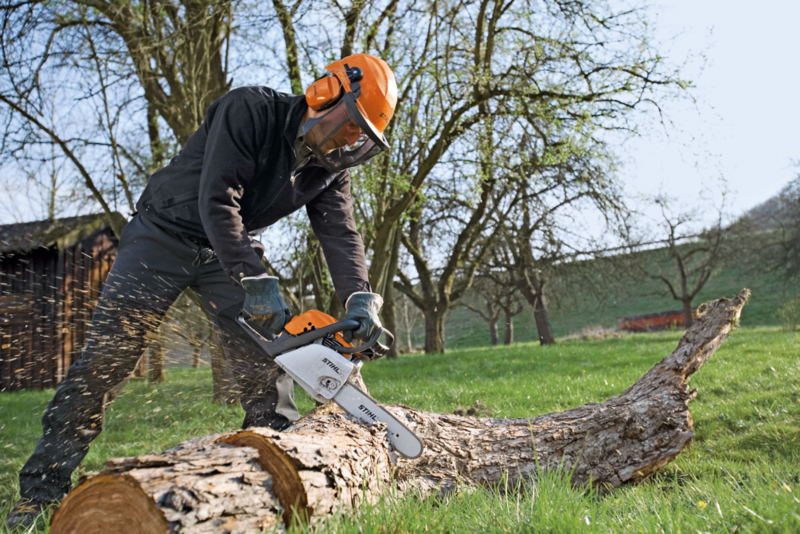 We have a range of chain saws, from the petrol-driven MS170 at £179.00 to the battery MSA120 C-BQ from £249.00 We have a range of tools for dealing with logs, from axes to powered log splitters. Do come into our shop where we offer hands-on experience of all our products, and our advice. Open weekdays from 8.00 to 17.00 and on Saturday between 10.00 and 13.00.